The low rider car show has been a highlight of TMY since the early days. It represents a long-time partnership with the Dukes Car Club, the oldest car club in continuous existence, with over 30 chapters all over the United States and abroad. Described once as “butterflies with transmission,” lowrider cars and oldies (pre-1950 Chevrolets) are an important part of the the history of the Southwest. At TMY, over 60 cars from 10 car car clubs in Southern Arizona are on display (Church and Pennington St). In an April 2017 issue of BorderLore, which featured a story on Dukes Car Club, folklorist Jim Griffith brings attention to the “baroque sensibility” of lowriders, a style that draws from the Spanish colonial architecture and religious art of 18th century Mexico, seen at the Mission San Xavier del Bac south of Tucson. “The richness of color, the richness of material, implied motions in the way the cars are cocked up on one side, the plethora of detail and the general sense that more is better,” Griffith said. At TMY, you’ll see these “visual puns,” along with brightly colored paint jobs and highly-shined chome. 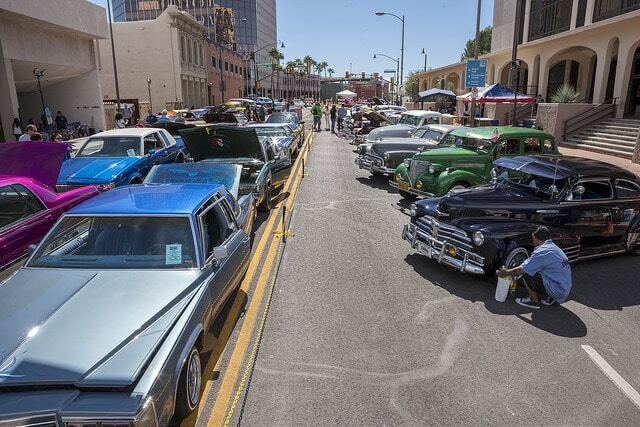 You’ll also see hot rods, electric cars, monster trucks, pedal cars, and low rider bicycles. Talk to car owners on site to learn more about their work and about what these “artifacts” and treasures mean to them.